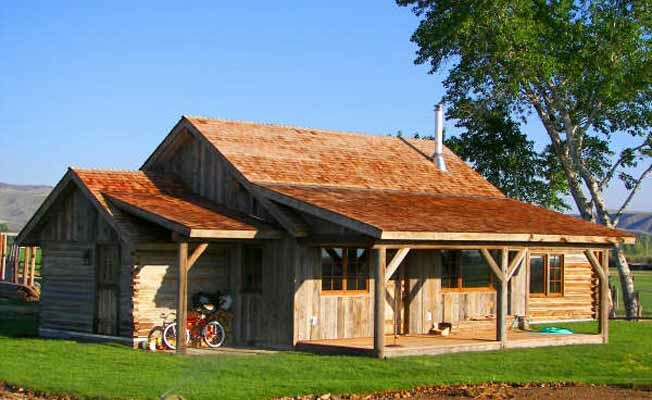 At the J Bar L winter ranch headquarters near Twin Bridges, Montana, just a few miles from the famed Big Hole and Beaverhead Rivers, we now offer a newly restored homestead cabin rental that is excellent choice for guests who love to fly fish. We are happy to help arrange (for additional fees) guided fishing and/or private access to a neighboring ranch on the banks of the Big Hole River and a spring creek-like stream. This deluxe rental cabin has one bedroom with a king-sized bed that is divisible into two extra-long twin sized beds, a full bath and a living room with a comfortable queen-sized sleeper couch. The lovely living room and dining room have views of the Ruby and Pioneer Mountains. Bordering our hay meadows, the house is set next to a lively trough that is lined with cottonwoods. A screened-in porch with outdoor furniture lends itself to reminiscing about the day's catch over a relaxing dinner, curling up with a good book or watching the deer graze the meadows.